Passing through Union Square daily on my morning walk to work, I tend to encounter tourists trying to plan out their day on those free maps handed out by hotels or kiosks. With most of downtown San Francisco squeezed into 4 square miles, the popular destinations are much closer than most people realize. 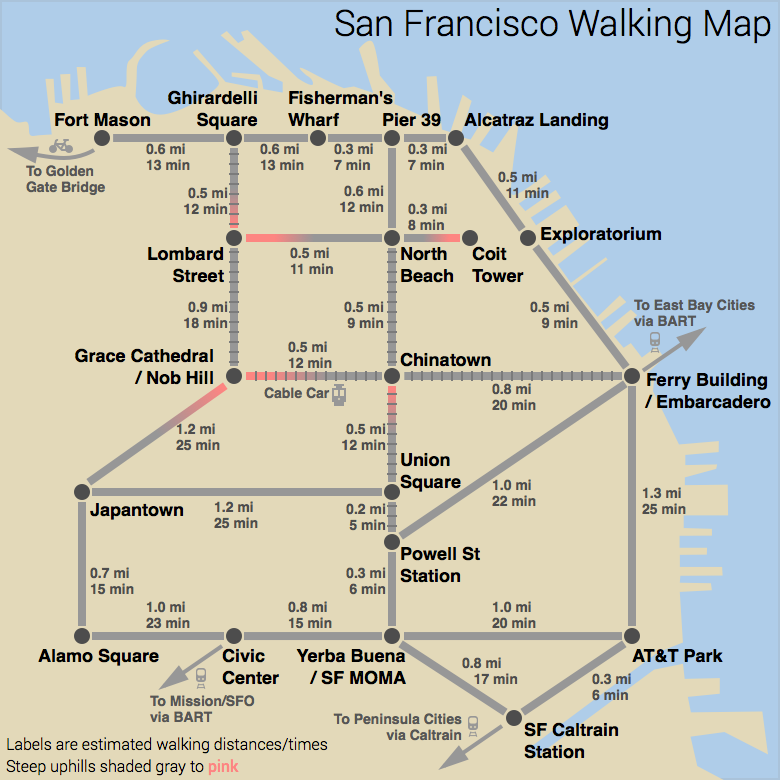 I've created a subway-style map of San Francisco meant to encourage visitors and locals alike to walk. The routes are shown with walking distances and travel times between popular destinations. For simplicity's sake the map does not give precise directions, but presents walking as just another transportation option analogous to driving and public transit. The map makes seemingly distant destinations appear more feasible by foot, and can be a useful tool for urban wayfinding. And perhaps those ad-supported tourist maps can be aided with a map similar to the one above. Inspiration for the map was also drawn from Pontevedra's Metrominuto Map.